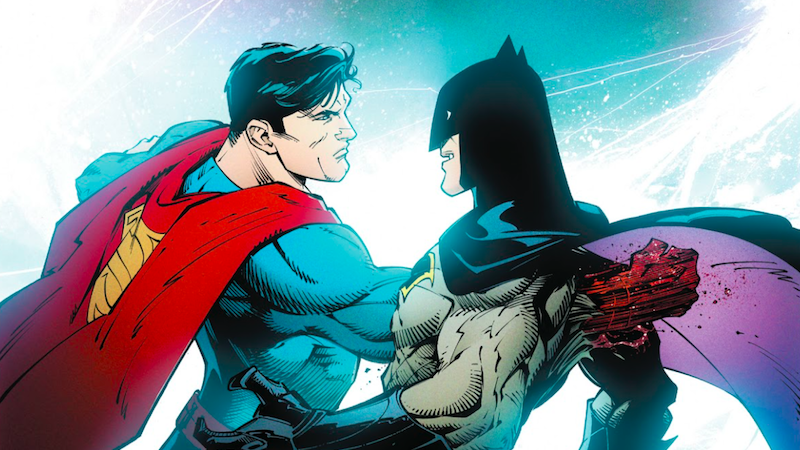 DC Comics’ current crossover event is Dark Nights: Metal, a Batman-focused affair filled with melodramatic pseudo-science about the threats coming from an evil alternate multiverse. The second issue is out this week, and it’s setting the bar for a whole new level of crazy. In the real world, we know that Dark Nights: Metal is about some messed-up versions of the Dark Knight that will be crossing over into our reality. In the comics, the story so far has seen the main Batman chasing a secret history concerned with the supposedly cursed nature of his own family. Though DC’s done an admirable job, dropping plenty of hints and clues about what the hell is going on in the Dark Nights: Metal event, the core comic is still the sort of wild story that you’ve got to closely follow from issue to issue in order to fully wrap your mind around the plot. Now that the rest of the Justice League has learned that Batman is the prophesied key to bringing an ancient evil into existence from the dark multiverse, they’re trying to keep Batman from further investigating the nature of his fate. When last we saw Batman, he’d just stolen a chunk of Nth metal from Kendra Saunders, hoping to use it to figure out the mysteries of the dark multiverse detailed in Carter Hall’s journal. Since then, Bruce has recruited the entire Batfamily to help him evade the League by having all of the Bats dress up in convincing replicas of Bruce’s suit and leading the Leaguers on wild goose chases around the world. What the others don’t understand, Bruce repeatedly reminds himself, is that the matter at hand isn’t just about Batman. It’s also about how the Wayne family is linked to the interdimensional being, Barbatos (currently located in the dark multiverse), that Hall warns of in his journal. But because Bruce doesn’t actually know much more about Barbatos or what he can do to prepare to fight the being, you get the feeling that he isn’t really running from the Justice League because he’s got a long-ago, thought-out plan in the works. He’s running because he’s genuinely scared. Or so it would seem. Pulling off a fast-paced action sequence involving decoys and hidden identities is difficult enough to do with live action or animation, where there’s motion to help sell the visual misdirections. Jonathan Glapion and Greg Capullo’s illustrations manage to do that and more. How absurd is this book? Superman and Wonder Woman catch Batman only to discover that he’s actually a temporarily cooperative Clayface who’s stalling for time, while the real Bruce Wayne is off with Dream of the Endless raiding the tomb of Prince Khufu in the Egyptian Valley of the Kings. In his research into the history detailed in Carter Hall’s journal, Bruce has deduced that the Strigydae, Barbatos’ human worshippers, have been hunting for him; he’s their perfect key to perform a ritual that will allow Barbatos to cross over from the dark multiverse. For years, the Strigydae have been lurking in Bruce’s shadow, poisoning his body with the necessary heavy metals that would eventually anchor him to one dimension as Barbatos uses his body as a gateway to move through. Bruce first became connected to Barbatos when Darkseid’s omega beams flung him back through time and space to the beginning of existence. Barbatos, Bruce explains, was the only reason that Bruce was able to return to his own time, something that the demon would one day use to its advantage by using Bruce as a portal to escape from the dark multiverse. Rather than waiting for the events foretold by the prophecy, Bruce pulls an infant-sized Darkseid out of his bag (Darkseid’s a baby right now, don’t ask why) and says that he plans to use the baby’s omega beams to go back to the beginning of time again to kill Barbatos. But this is only the second issue of Dark Nights: Metal; it’s not like the event’s about to just end. Of course there’s yet another plot twist. Just as Batman’s about to use an alien baby to rip open a portal to the past, he, Wonder Woman, and Superman are overtaken by a trio of Strigydae wielding bat staves and three members of the Court of Owls who lured Batman to the wrong tomb in the first place. With all of the necessary pieces lined up just so, the Strigydae begin their ritual to summon Barbatos, and Batman’s body does begin to dissolve into some sort of cosmic substance before turning into a glowing hole in the ground. This is the point in the story where you’d imagine that Barbatos’ clawed hand would jut out of the Bat-portal as the demon heaves itself from the void. What jumps out instead, though is far, far more unsettling: three crazed, demonic children wearing Robin costumes who promptly begin to attack the Court of Owls. The children are soon followed by Barbatos and the demented Dark Batman League that DC has been teasing for weeks now—and they’re not nearly as cagey about their identities as their mainstream counterparts. Wonder Woman demands to know what’s become of their Bruce Wayne as she watches the Robins lick blood from their faces and the evil Batpeople explain that they are Bruce Wayne. For a book that doesn’t actually spend much time giving Batman a chance to verbalize the introspective part of his monologue, Dark Nights: Metal #2 is actually a rather thoughtful reflection on some of the ideas that are running through it. Bruce already rightfully feels largely responsible for setting off the series of events that’ve caused everything that’s happening with Barbatos. But Dark Nights amps up whatever guilt Bruce is feeling by highlighting the fact that his intellect and Batman identity, the same things that these other incarnations of himself claim, are going to be the most dangerous things about the story. There was never really any doubt that the evil Batpeople were going to be Dark Nights: Metal’s primary villains, but actually seeing them together as a squad after watching the original Batman outsmart the Justice League is its own kind of unsettling experience. One good Batman was already enough to put the lives of billions of people at risk, but now there are at least seven versions of him running around, all hellbent on destroying what’s left of DC’s multiverse.